The SC1650 is the perfect machine for the homeowner who needs strong equipment but does not want to pay the commercial duty price. The SC1650 is built by MacKissic with the same quality standards and craftsmanship that all other products are made. In its shredding section, the SC1650 features 36 free-swinging hammers. This hammermill will produce up to 86,400 hits a minutes. It just pulverizes material put into the hopper chute. 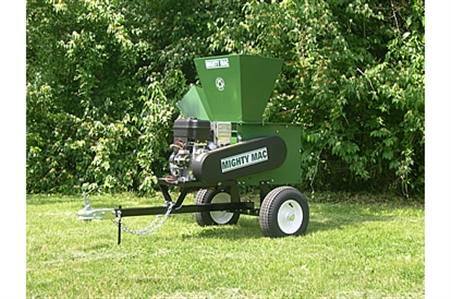 The chipper has a single heat-treated steel knife that aggressively chips branches and small trees up to 4 inches thick. 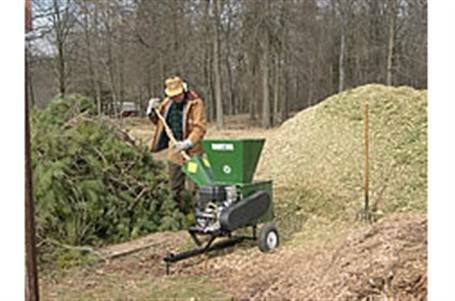 In less then 60 seconds, the chipper will turn a 10 foot branch into clean, crisp, thumbnail sized chips that are great for mulching! There are two models to choose from; the SC1650E and the SC1650HTE. The SC1650E is tractor or ATV towable while the SC1650HTE is highway towable. The trailers for these machines have pneumatic tires for easy manuverability and smooth towing. Chipper Hopper Opening: 11-3/4 in. x 7-3/4 in. Chipper Hopper Throat: 4-1/8 in. x 4-1/4 in. Flywheel Size: 13 in. x 3/4 in. Flywheel/Rotor Weight (lbs. ): 67 lb. Shredder Hopper Opening: 18-3/4 in. x 18-1/2 in. Shredder Hopper Throat: 11 in. x 5-1/2 in. Rotor Weight (lbs. ): 38 lb. Storage Space (L x Wheelbase x H): 61 in. x 39 in. x 46 in.